Why to Use HTML5 and CSS3 for Your Business? As more and more people now prefer smartphones or tablets over PCs to surf the internet, mobile friendly sites with good user experience have become the need of the hour. Paying heed to the current demands of rich media, cross device and mobile internet access requirements, the World Wide Web Consortium (W3C) in October 2014 published HTML 5, the fifth and the latest version of the HTML standard. One of the biggest differences between HTML5 and previous versions of the HTML standard is that it provides one common interface to load elements in multiple browsers. Since the older versions of HTML require proprietary plugins and APIs, a web page that was built and tested in one browser may not load correctly in another browser. But same is not the case with HTML5, which completely obviates the need of installing a Flash plugin by allowing the element to run by itself. HTML5 was designed keeping in mind cross-platform mobile application development. Besides, new syntactic features in HTML5, like video, audio and canvas tags, were specifically introduced to support multimedia on mobile devices. Offline storage is also one of the virtues of HTML5…read full blog here- Why to Use HTML5 and CSS3 for Your Business? According to PYPL Index (PopularitY of Programming Language) and TIOBE Index (The Importance of Being Earnest), Java is the most popular programming language world over. Since Java was introduced 20 years ago, several libraries, utilities, and programs are already available in the tech market that tout to be the best for Java development. However, before you choose a tool for your Java project, it’s paramount to know about its functionality, simplicity, flexibility, effectiveness and how suitable it is for your project. 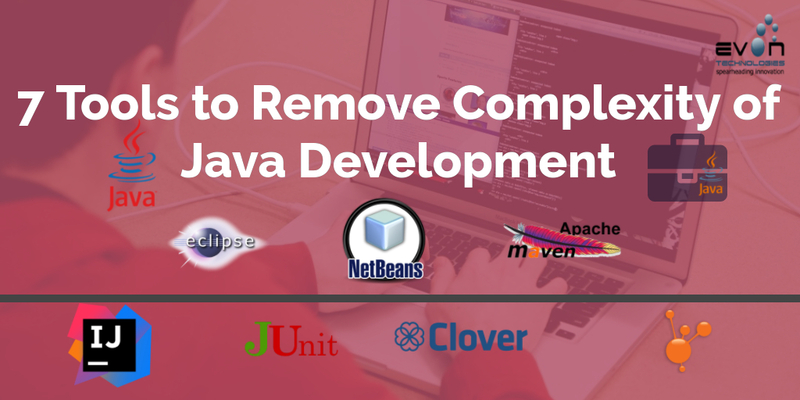 That said, I am discussing 7 popular Java tools you may find worth using to remove the complexity of your Java development project in 2017. Eclipse, an open-source integrated development environment (IDE) and sponsored by IBM, continues to be one of the top choices among Java developers. Eclipse offers constant assistance while coding. So, instead of digging through documentation, you can complete your code through methods with ease and in quick time. Eclipse also offers tool-assisted refactoring and syntax checking, which ensures that developers write correct code while they type. Eclipse also offers Java Development Tools (JDT) project that provides a set of plugins to empower the Eclipse platform with a full-featured Java IDE. Easy access to a wide range of plugins helps developers build all kinds of Java applications. However, many businesses find managing the general cloud usage and costs a very challenging task, especially when running across multiple cloud platforms. To better their plight, many companies, including some tech giants, have developed special tools for cloud management. That said, I am listing 7 cloud management tools you may like to choose from for your business in 2017. Note: There is no denying that a cloud management tool, apart from these 7, could also prove to be the best fit for your business based on features and functionalities you need. So, don’t feel offended if I miss out on your favorite cloud management tool. Cloudability is an easy-to-use SaaS product, specifically designed for cost management by monitoring and optimizing cloud expenses. It helps provide better, faster and comprehensive access to data that consists information about your cloud spend and usage. Not only this, the software generates budget alerts and daily reports to keep you updated on finance. Cloudability supports multiple public, private, and hybrid cloud service providers. With Cloudability, it’s easy to identify the resources you’re paying for but not using, and see spending breakdowns to know which services and accounts are costing you the most. Besides, it offers Reserved Instance (RI) planner for effective provisioning of Amazon reserved instances. Cloudability currently supports Amazon AWS, HP Cloud, New Relic, IBM/SoftLayer, Rackspace, Heroku, etc. Cloudyn, a SaaS solution, offers various functionalities to provide unprecedented insights into usage, performance and cost of public and hybrid cloud deployments. Besides, the tool offers actionable recommendations and generates customized alerts to help managers improve performance and streamline cloud consumption and spend for increased growth. With Cloudyn, managers can access detailed information about cloud resources, governance, and reporting through a single dashboard and email alerts.